I had a stroke, my left leg & left arm was paralyzed for quite a while. As soon as I am ready & able, I have four feature films to make with Hardy, we are going back to our old Studio (Hal Roach) needless to tell you how happy I am - never thought I would ever work again. 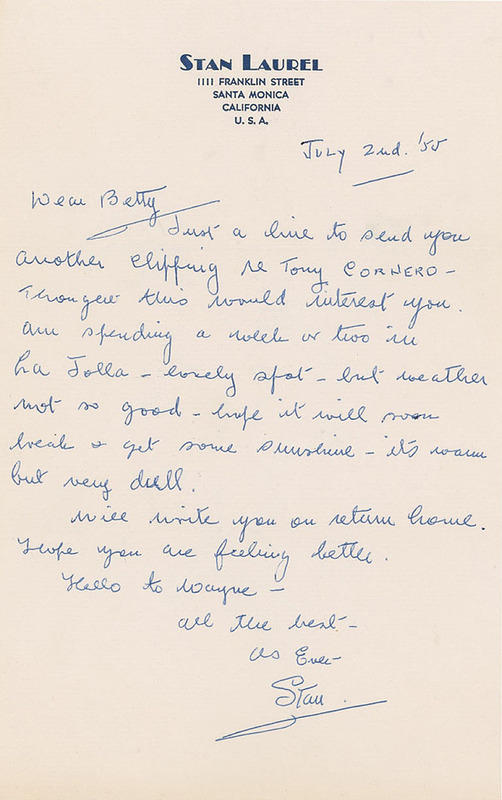 Just a line to send you another clipping re Tony CORNERO - thought this would interest you. Am spending a week of two in La Jolla - lovely spot - but weather not so good - hope it will soon break & get some sunshine - its warm but very dull. Will write you on return home. Hope you are feeling better. Hello to Wayne - all the best. Anthony “Admiral” Cornero (1899-1955) was an organized crime figure in Southern California from the 1920s through the 1950s. He later became one of the first gangsters to become involved in syndicate-backed casinos in Las Vegas, specifically the Stardust on the Las Vegas Strip. I came back from La Jolla a week ago, apart from dull weather I enjoyed the change & I think it did me a bit of good - am walking better anyway - I ate out in restaurants so the exertion of getting in & out of the car etc. helped me a great deal - it was exercise for me. I know Apple Valley is a wonderful spot, but for some reason the Desert & Mountains are very depressing to me - am much happier near the Beach & Ocean - should have been a sailor I guess! Pleased to note you get the clippings OK. & hope now you will soon be on your way to Vegas where you & Wayne will be both working & have a chance to do very well. Note that you mention re Ruth, I understand she sold her Palm Springs a couple or more years ago & doesn't go down there anymore - so was a bit surprised to hear your news. She calls my daughter Lois once in a while - that's how I get my information anyway. I couldn't care less! Yes, I have been seeing the $64,000 Program, its certainly exciting. Glad you are feeling so much better, you deserve a lot of credit taking off so much weight, that's wonderful! My Dr. has just arrived to give me an electric treatment, so all for now Betty. Give my best to Wayne & self. Virginia Ruth Rogers was married to Stan twice, first from 1935–38 and again from 1941–46. The $64,000 Question was a popular United States television game show from 1955 to 1958. Herewith clippings I told you about.